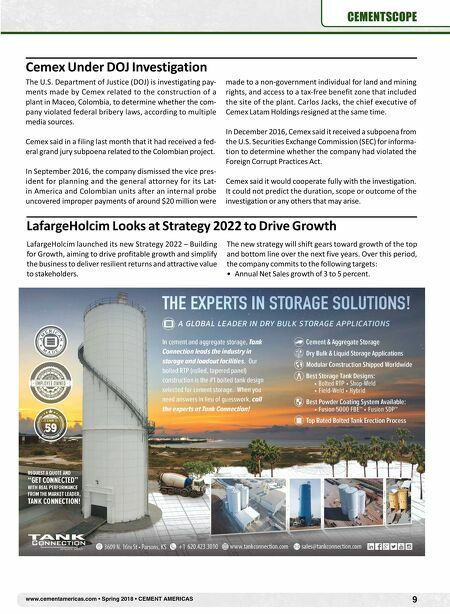 8 CEMENT AMERICAS • Spring 2018 • www.cementamericas.com CEMENTSCOPE "Nevertheless, we were able to increase our result from current operations as guided. The consistent focus on effi- ciency and margin improvement and the successful integra- tion of Italcementi that led to higher than expected syner- gies contributed to this success. Overall, 2017 was a record year for sales volumes, revenue and result from current operations," he said. In the reporting year, sales volumes of the core products – cement, aggregates and ready-mixed concrete – rose sig- nificantly as a result of the consolidation of Italcementi in July 2016. Cement and clinker sales volumes of the group rose significantly due to consolidation by 22 percent to 126 million metric tons (Mt). Aggregates sales volumes record- ed a growth of 12 percent to 305 Mt. Ready-mixed concrete volumes increased by 11 percent to 47 Mt. Revenue and results of current operations before (RCOBD) and after depreciation and amortization (RCO) also increased significantly as a result of the consolidation of Ital- cementi. Revenue rose by 14 percent to €17.3 billion (pre- vious year: 15.2). Negative exchange rate effects impacted revenue by about €311 million. RCOBD also improved by 14 percent to €3.3 billion. In the fourth quarter, sales volumes increased in all busi- ness lines compared with the prior year's quarter. Cement and clinker sales volumes grew by 6 percent to 32 Mt due to a robust development in all group areas. Aggregate deliv- eries increased by 4 percent to 76 Mt. Except for Western and Southern Europe, all group areas contributed to this growth, especially North America. Ready-mixed concrete volumes improved slightly by 0.5 percent to 12 Mt. In North America, the growth in demand for building mate- rials continued, in particular due to the sustained economic recovery and declining unemployment figures. Main driv- ers in 2017 were commercial and residential construc- tion. With the acquisition of Italcementi's North American subsidiary Essroc in July 2016, the company significantly expanded its footprint in the United States (Northeast and Midwest) as well as in the eastern part of Canada. In addi- tion, HeidelbergCement strengthened its vertical integra- tion in the United States by acquiring the building materials business of Cemex in the Northwest and the operational assets of Saunders Companies in the Northeast. In 2017, particularly strong growth of building materials deliveries was recorded in the western U.S. and in Cana- da. Sales volumes in the regions West and Canada still suf- fered from bad weather in the first quarter but developed very positively for the full year. In Canada, sales volumes benefitted from the recovery of oil projects in the Prairie provinces as well as from continuing strong demand in the regions Vancouver and Seattle. Deliveries of cement and ready-mixed concrete in the regions North and South, how- ever, declined, due to bad weather. Overall, sales volumes increased in all business lines. Adjusted for consolidation effects, cement sales volumes improved, while sales vol- umes for aggregates, ready-mixed concrete and asphalt declined slightly. 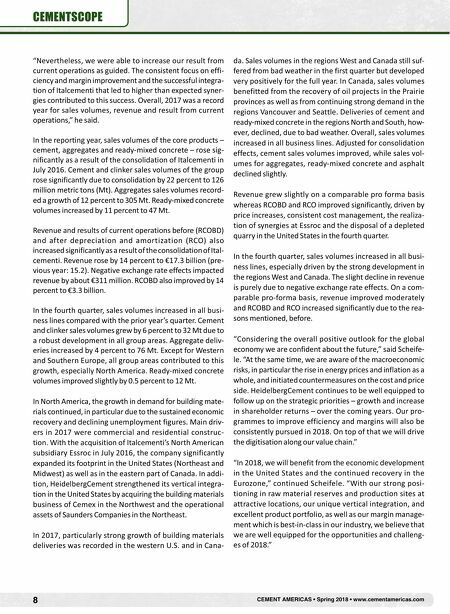 Revenue grew slightly on a comparable pro forma basis whereas RCOBD and RCO improved significantly, driven by price increases, consistent cost management, the realiza- tion of synergies at Essroc and the disposal of a depleted quarry in the United States in the fourth quarter. In the fourth quarter, sales volumes increased in all busi- ness lines, especially driven by the strong development in the regions West and Canada. The slight decline in revenue is purely due to negative exchange rate effects. On a com- parable pro-forma basis, revenue improved moderately and RCOBD and RCO increased significantly due to the rea- sons mentioned, before. "Considering the overall positive outlook for the global economy we are confident about the future," said Scheife- le. "At the same time, we are aware of the macroeconomic risks, in particular the rise in energy prices and inflation as a whole, and initiated countermeasures on the cost and price side. HeidelbergCement continues to be well equipped to follow up on the strategic priorities – growth and increase in shareholder returns – over the coming years. Our pro- grammes to improve efficiency and margins will also be consistently pursued in 2018. On top of that we will drive the digitisation along our value chain." "In 2018, we will benefit from the economic development in the United States and the continued recovery in the Eurozone," continued Scheifele. "With our strong posi- tioning in raw material reserves and production sites at attractive locations, our unique vertical integration, and excellent product portfolio, as well as our margin manage- ment which is best-in-class in our industry, we believe that we are well equipped for the opportunities and challeng- es of 2018."